What resources do you use in your classroom? Are they at the appropriate level for your students? If not, how can you modify your instruction so that all students can master content? Reading Mark Heintz's blog post on ditching the textbook yesterday made me think of the principle of comprehensible input. 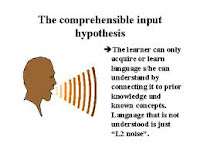 In world language instruction, comprehensible input is a key concept based on the research of Stephen Krashen. It basically states that students learn best when the language they hear is just above their current level of comprehension. In other words, they are given just enough new information to challenge them to build upon their background knowledge, but not so much that they become discouraged and give up. 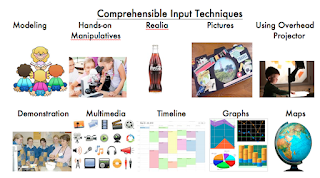 There is definitely more to Stephen Krashen's hypothesis, but my focus here is on how to make all learning comprehensible to students. Why do we continue to assign reading passages to students that are so far above their ability level? If the material is too easy, they gain nothing. The same is true if it is too difficult; they can not access the content and therefore can not link it to prior knowledge. Of course, we can try to bridge the gap by providing visuals, graphic organizers, examples, etc. However, it might be worth our time to re-evaluate the input itself. Always make content meaningful and relevant. Always incorporate multiple learning modes in direct instruction (visual, audio, kinesthetic). Instead of memorizing vocab lists, have students order and/or rank concepts and justify their reasoning. Instead of starting with the vocab list and then giving fill-in activities, start with vocabulary embedded in reading. An easy way to do this is to fill in those blanks for students to see if they can understand terms from context before even studying them. Conduct class surveys about concepts and have students create graphs to explain / summarize. Break up sentences into two parts where students match the first half with the second half (i.e. cause - effect). Before fill-ins, try matching opposites, true/false or logical/illogical exercises. Have students illustrate concepts they have read. Pick a side: have students take a stand by moving to one side of the room or the other.